"Lady Liberty Personal Checks" product is already in your cart. Lady Liberty Personal Checks feature a patriotic shot of the Statue of Liberty against the American Flag. The statue of Liberty is a portrayal of Libertas, the Roman goddess of freedom. She bears a torch symbolizing the light of freedom and a tablet inscribed with the date of American Independence. A gift of the French nation, it was originally called 'Liberty Enlightening the World' and it has become an American icon, symbolizing our freedom. Show your pride and patriotism with Lady Liberty Personal Checks. 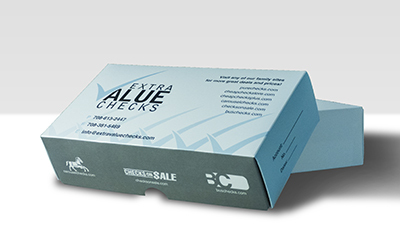 They are available in single and duplicate check format. Matching address labels and a coordinating checkbook cover are also available.